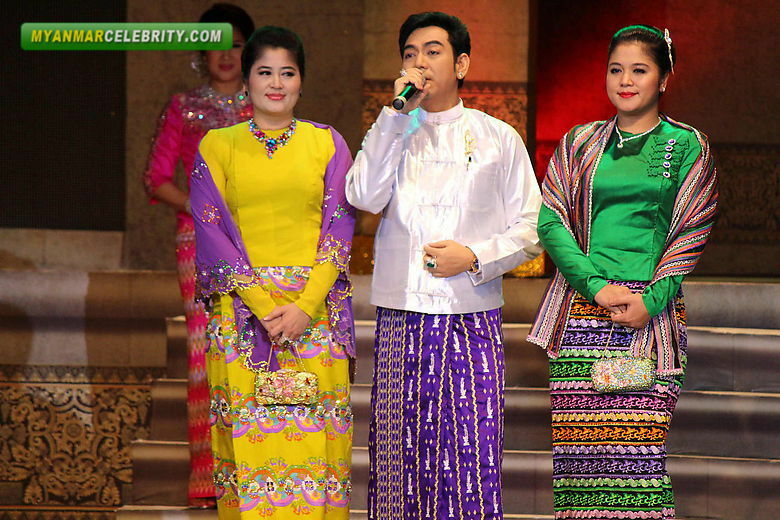 I wrote recently about the similarities between the costumes of the major southeast Asian peoples, but of course they were able to distinguish each other. 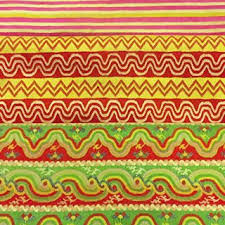 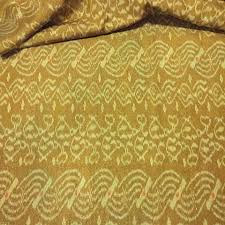 One of the major differences is in the type of textiles which were made and used. 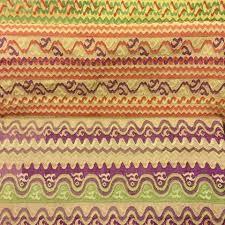 Today I will talk about the Bamar people and the style of weaving called Luntaya Acheik. 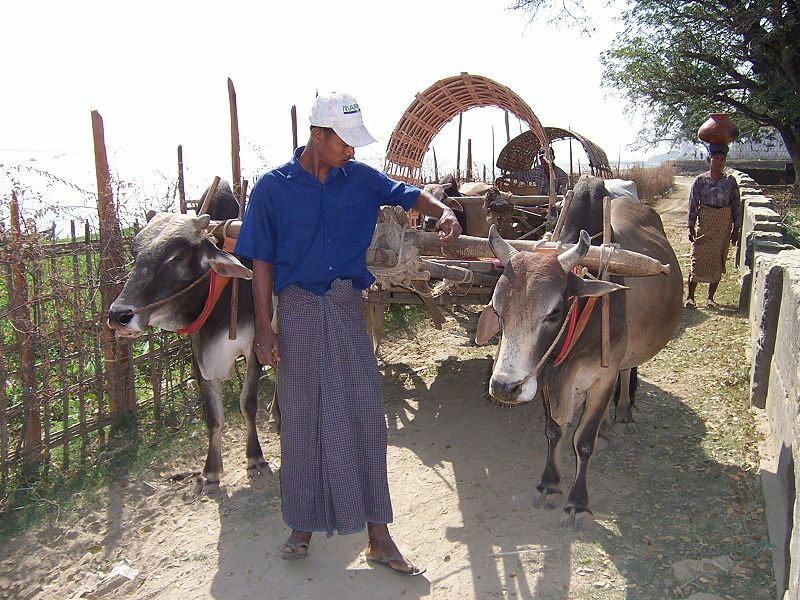 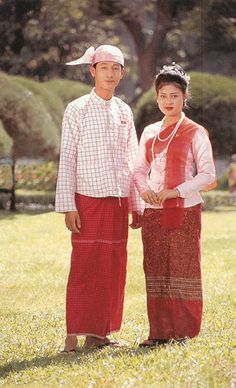 The Bamar people form 68 percent of the population of Burma, living mostly in the lowlands along the Irrawady river. They arrived in the 9th century from the north, speaking a language with the same roots as Tibetan. When settled in the upper Irrawady basin they encountered the ancient great civilization of the Mon, from whom they learned much, and whom they later pushed out of most of their territory. 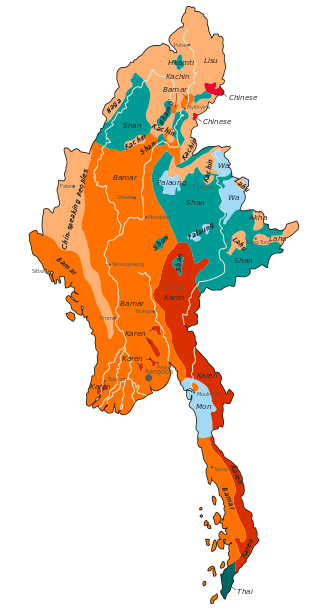 The Bamar are represented in orange on the map below, the green representing Tai peoples [Shan, Hkamti, Kuen], The rust the Karen, the pale blue Austroasiatic peoples [Mon, Palaung, Wa], and the pale orange other Tibeto-Burman peoples [Chin, Kachin, Akha, Lisu, Lahu]. 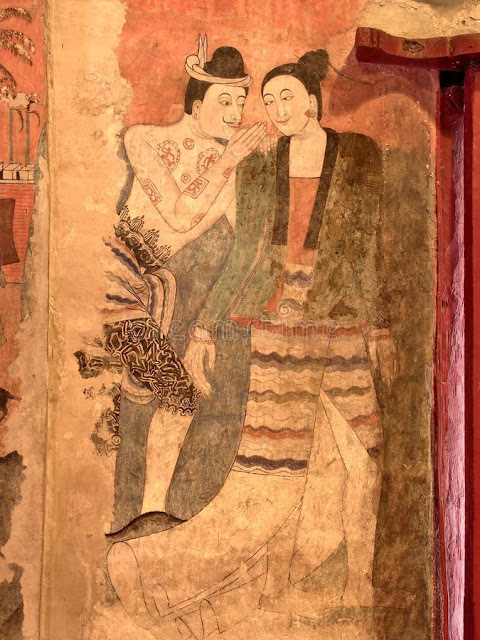 The mural above was painted on the wall of Wat Phumin in Nan province, northern Thailand, but it represents a pair of Burmese lovers, who were frequent travelers in the area. 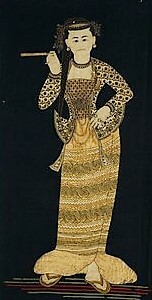 The mural dates to around 1870. 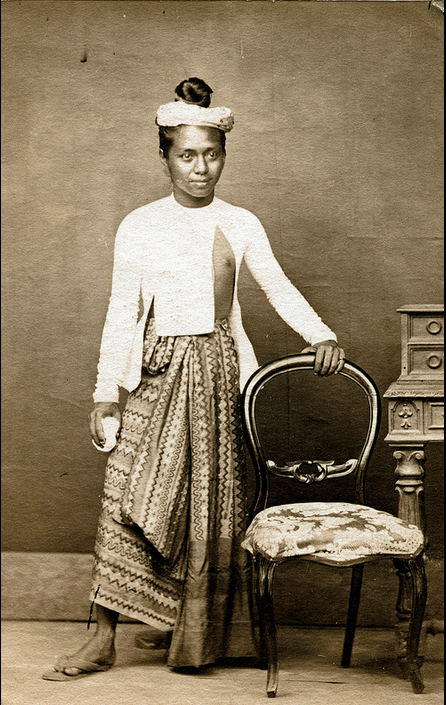 Several features indicate that the two are Bamar, including the red upper body tattoos of the man, and the clothing of both. 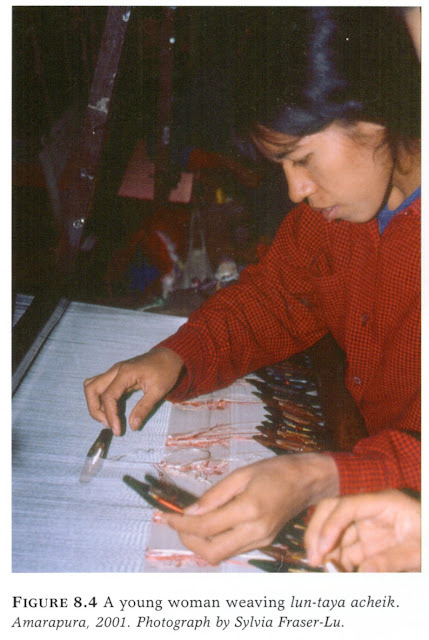 The wavy lines on both of their garments are meant to indicate the Luntaya Acheik technique of weaving. 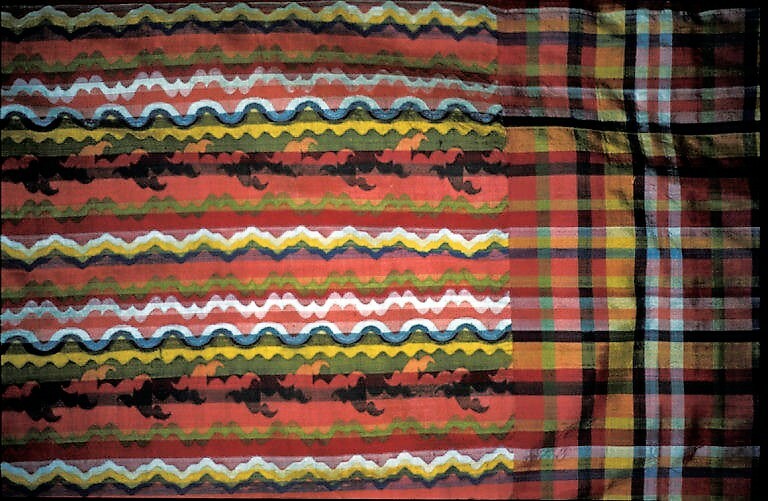 This was and is very characteristic of the Bamar People. 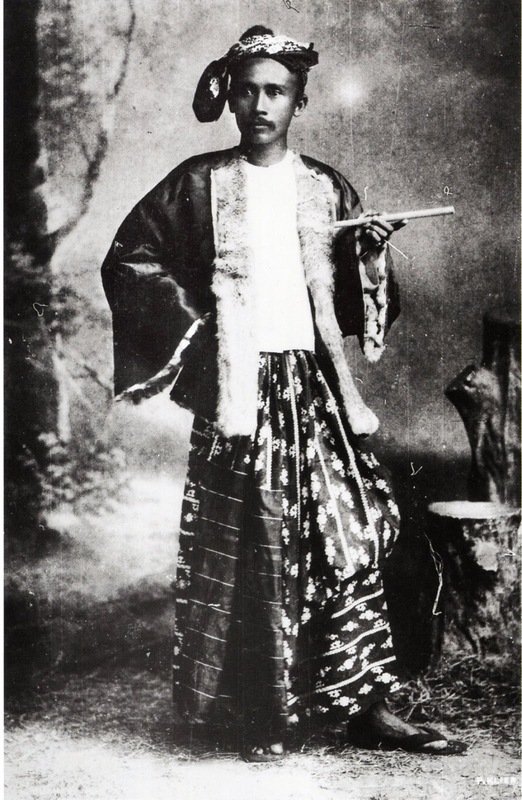 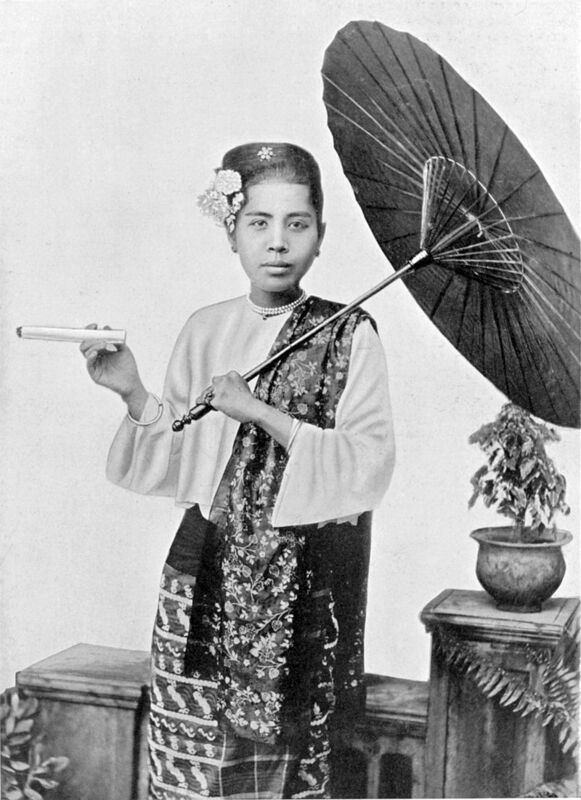 Here is a photograph of the old Bamar costume. 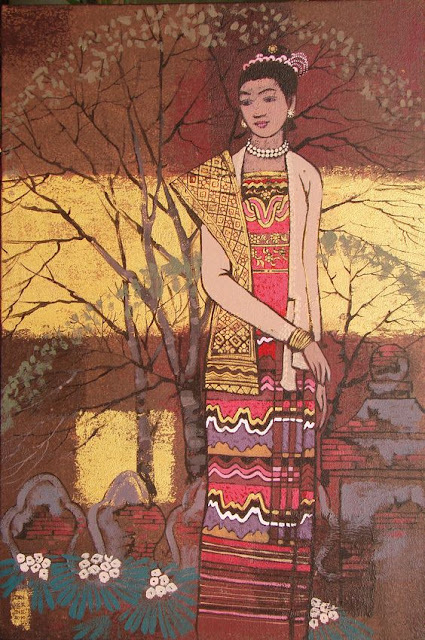 Comparing the mural to the photograph, the outfit is essentially the same. 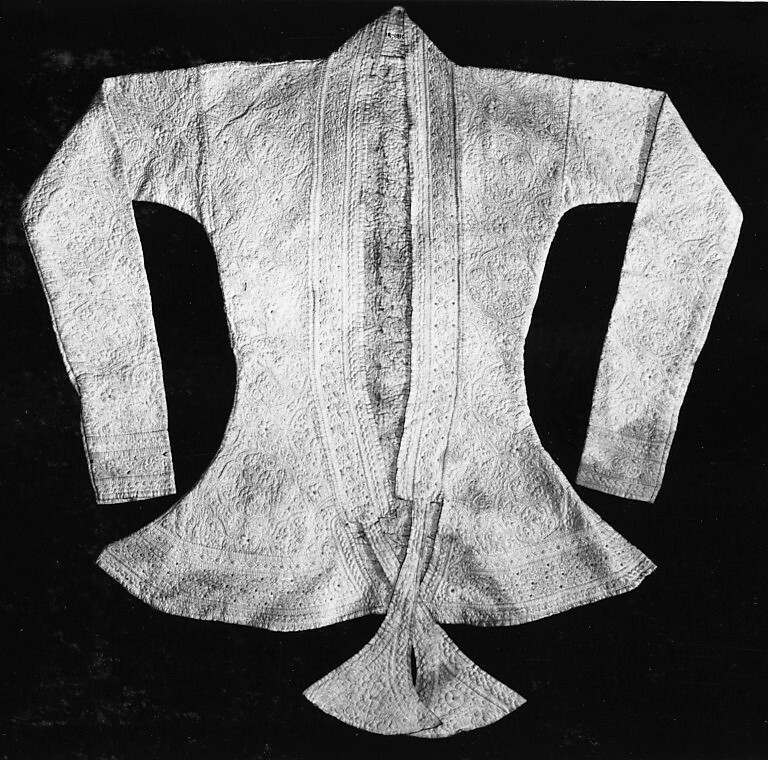 There is a bodice, perhaps just a cloth wrapped around the torso, a jacket, called eingyi, which is pinched at the waist and flared at the bottom, and a cloth wrapped around the hips which opens in front and drags on the floor, forming a train behind. 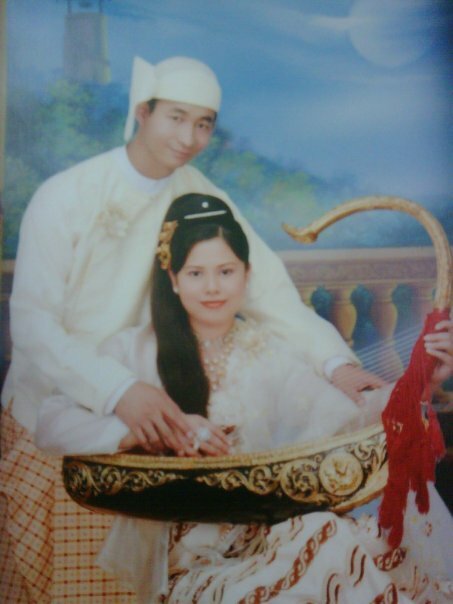 This is called htamein. In this photograph, you can see that the htamein was made in three parts, which was common. 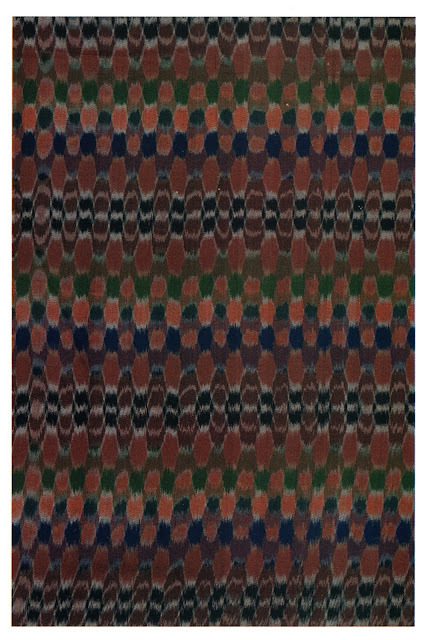 There is a plain waistband, in this example black, a central portion which is highly ornamented, and a simpler bottom portion which forms the train. 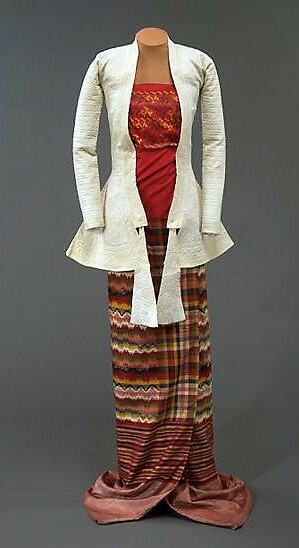 Here is a similar outfit from the Victoria and Albert Museum. 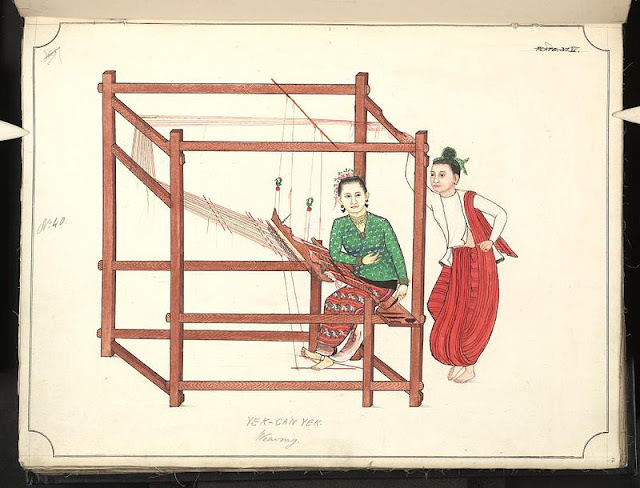 And a couple of drawings from the same period. 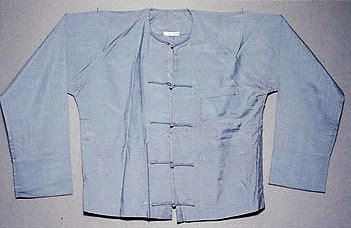 The eingyi jacket usually had ties, which were not always actually tied, and was sometimes made of very sheer material. 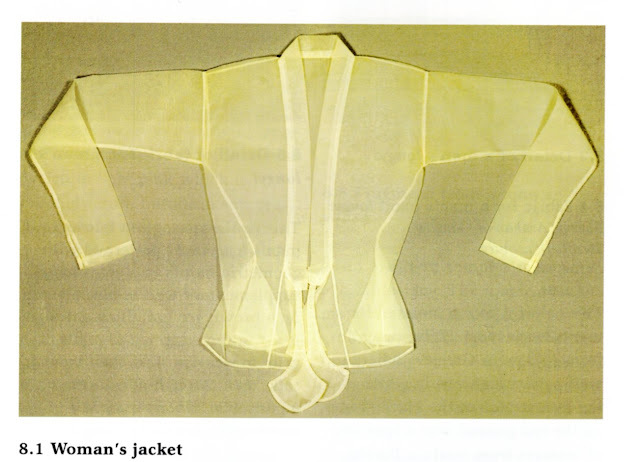 Here are the bodice and htamein shown without the jacket. 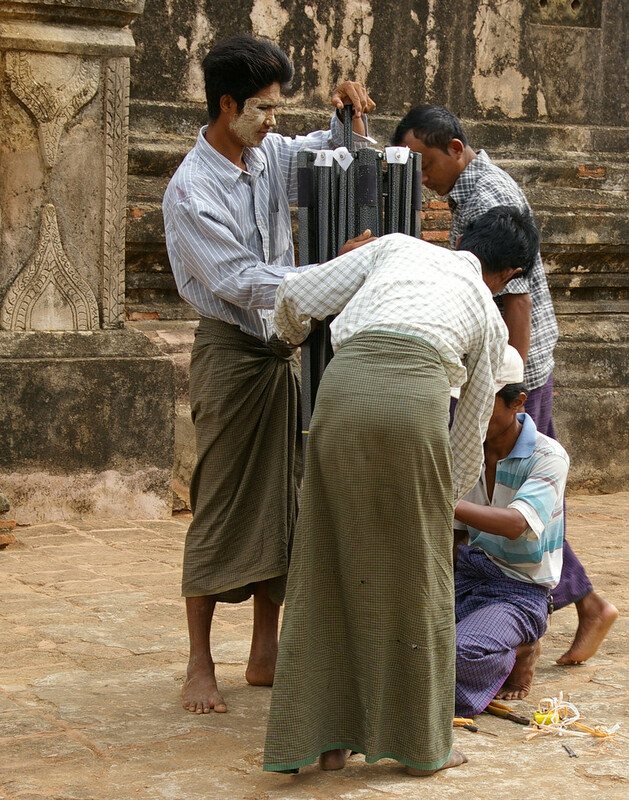 Here is a htamein showing the three part constuction. 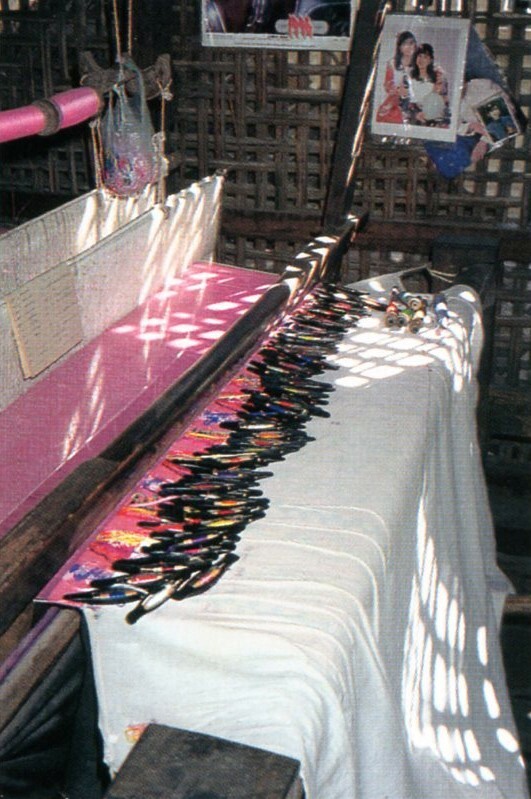 The most sought after htamein were, and continue to be, made by the technique called luntaya acheik, or hundred shuttles. 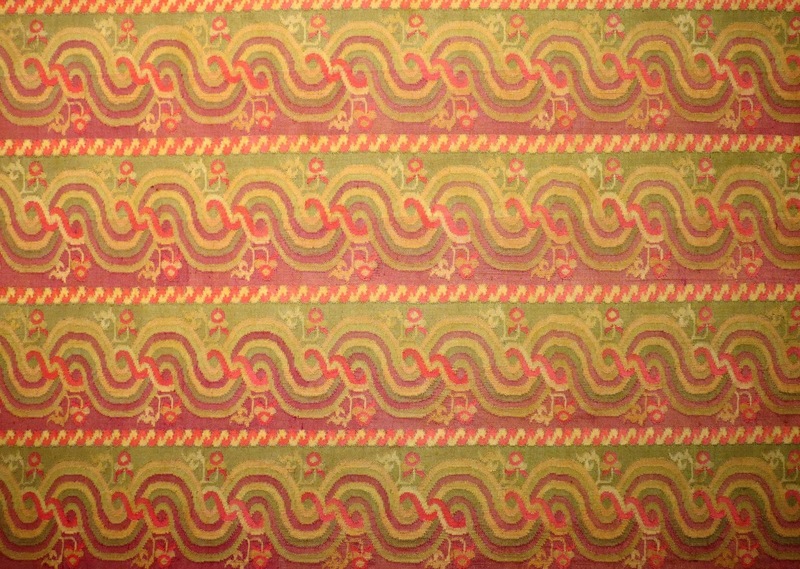 Here is a closeup of the middle part of the htamein above. 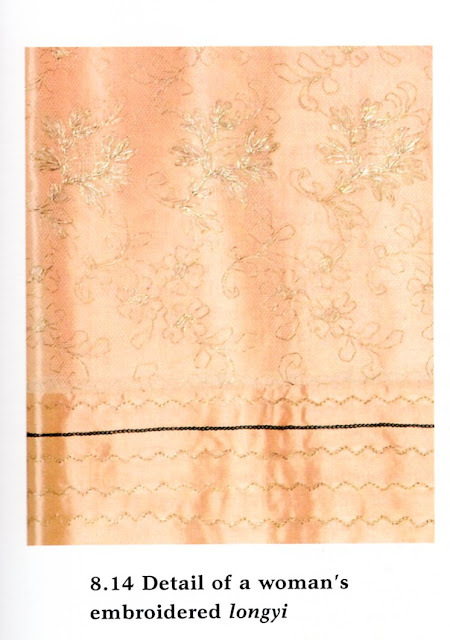 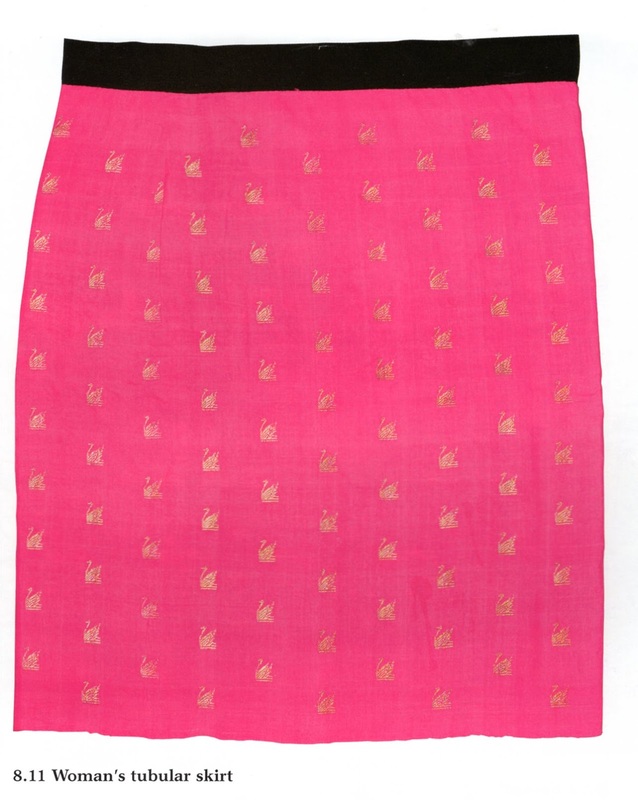 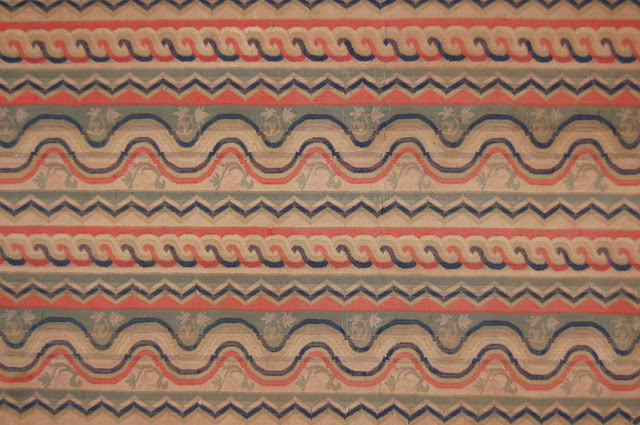 The middle part is woven in extremely fine interlocking tapestry weave, here shown with the weft vertical. The different colors are woven separately, back and forth. On the loom it would have looked like this. 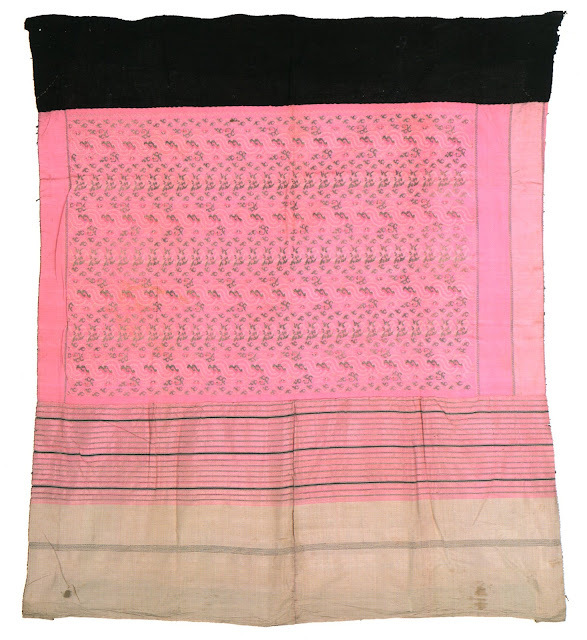 Women sit at the loom in pairs, and even skilled weavers can only weave a few centimeters a day, so this cloth is expensive, but very popular. 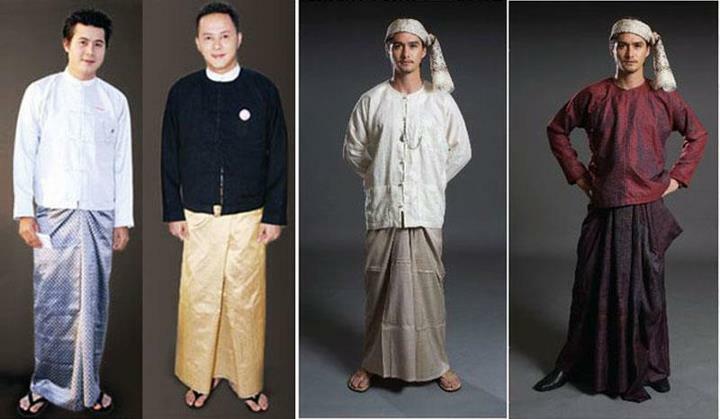 Even today most people have at least one wrap of luntaya acheik for special occasions. 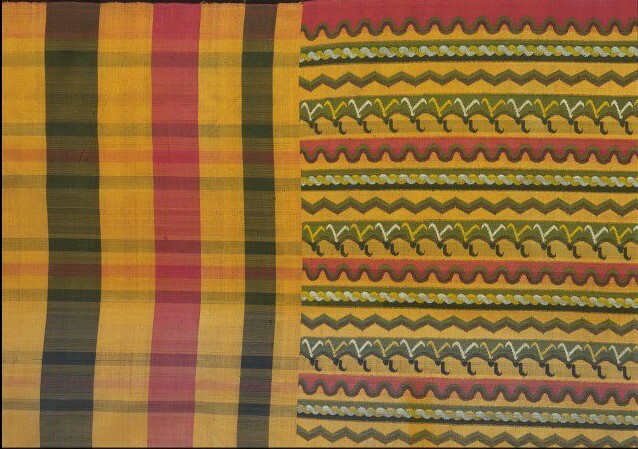 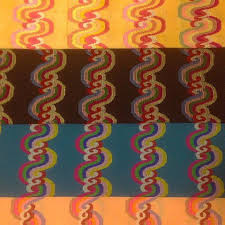 The designs are woven in bands a few inches across, thus forming the wavy lines which are depicted in the painting at the head of this article. 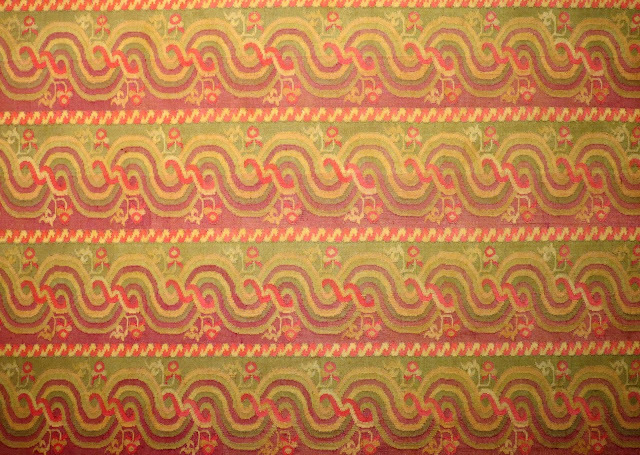 This effect cannot be achieved by any other technique. 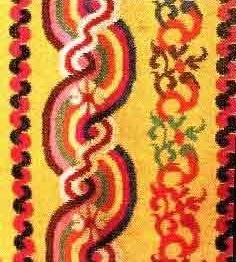 Here are some more examples of designs woven with this technique. 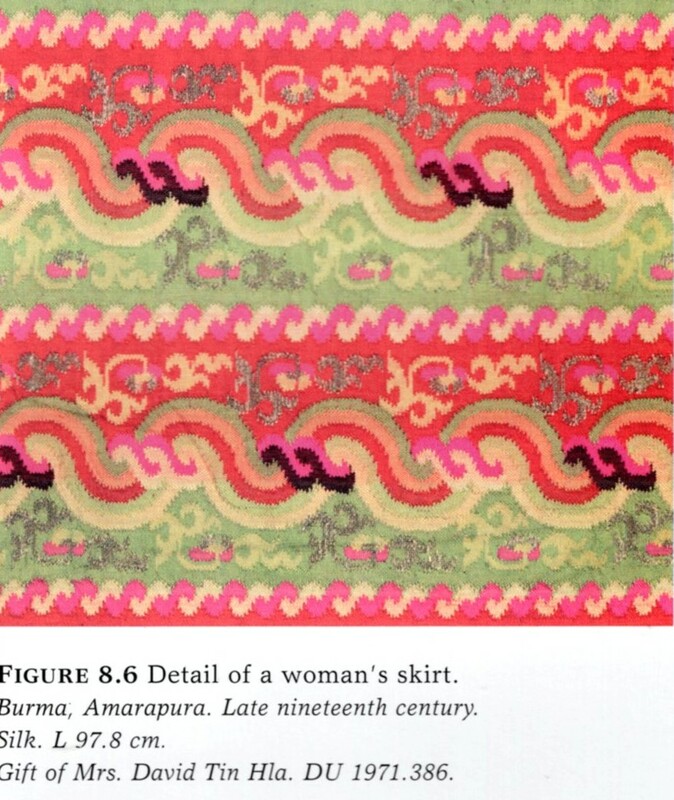 Men wore these designs as well, but less commonly. 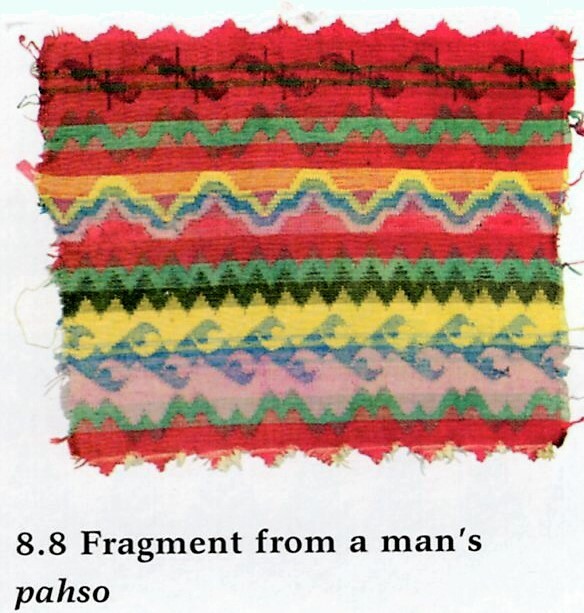 Here is a piece of a mans pahso, which almost functions as a sampler of luntaya acheik designs. 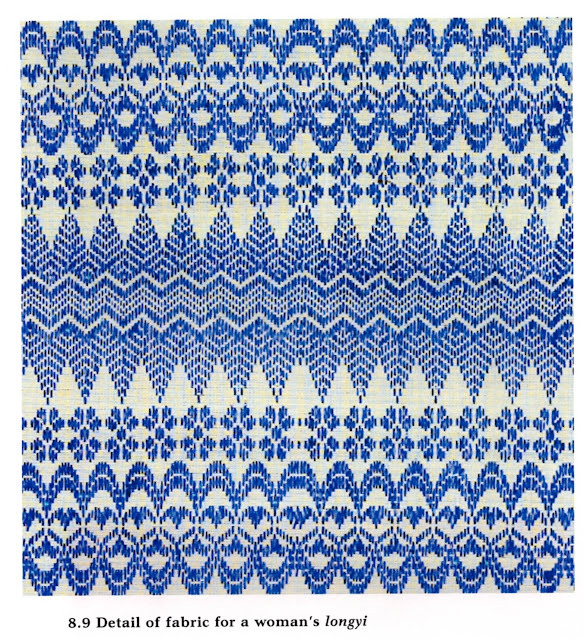 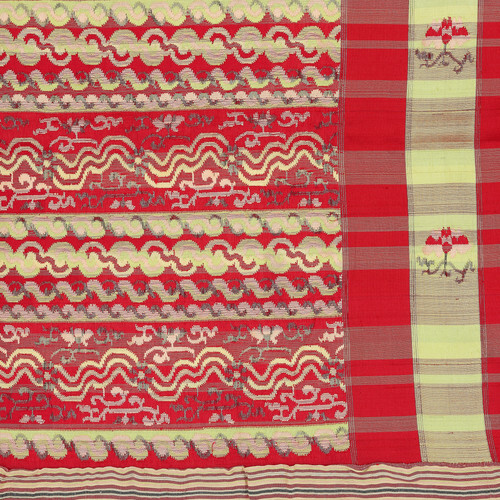 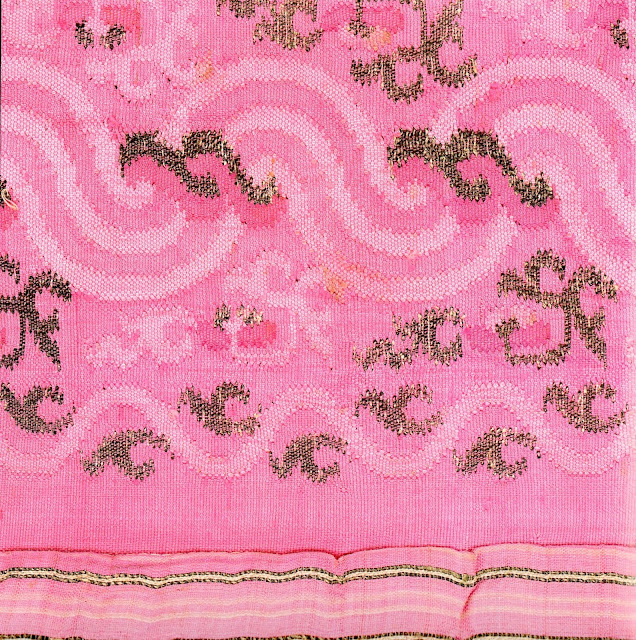 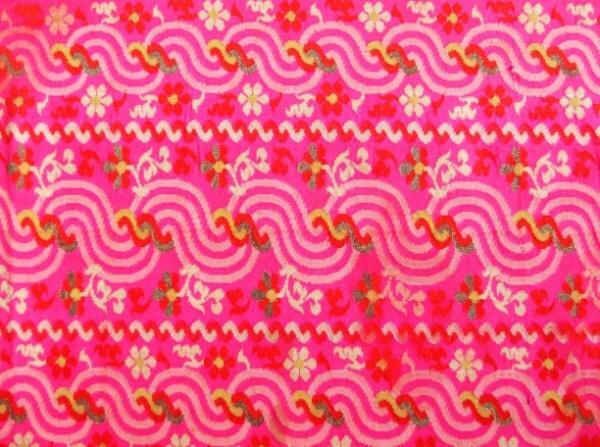 In Arakan, some attempt was made to imitate this effect with supplemental weft weaving. 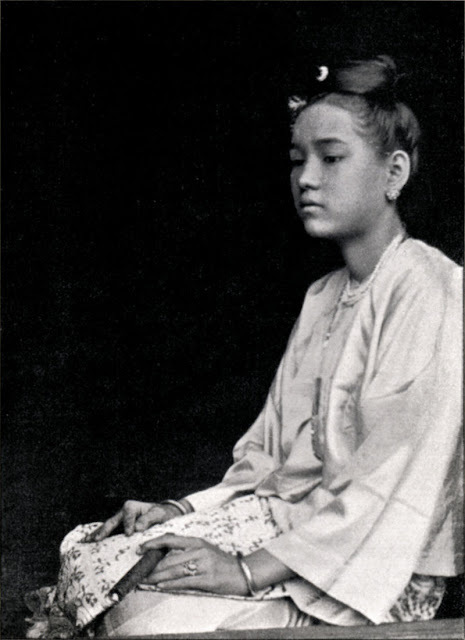 While the result was pleasing, it could not be confused with luntaya acheik upon examination. 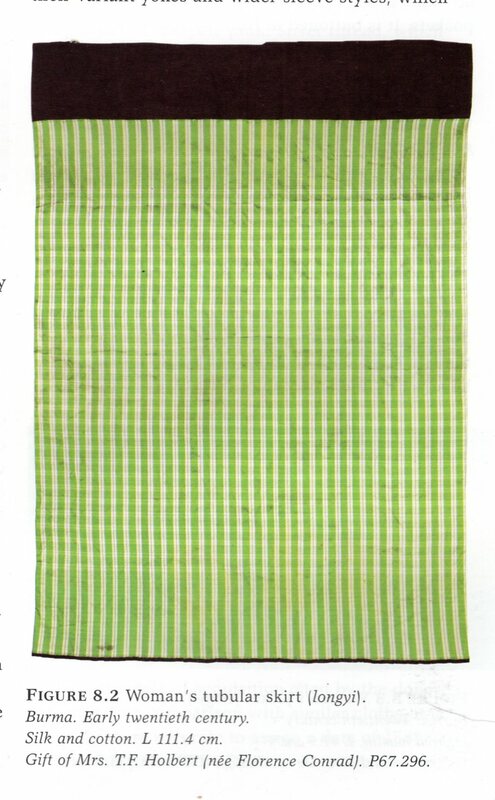 With the passing of the monarchy and entry into the 20th century, the htamein gave way to the longyi, The longyi was often sewn into a tube, and worn with the fold on the side. It did not have a train but hung no longer than the ankles. 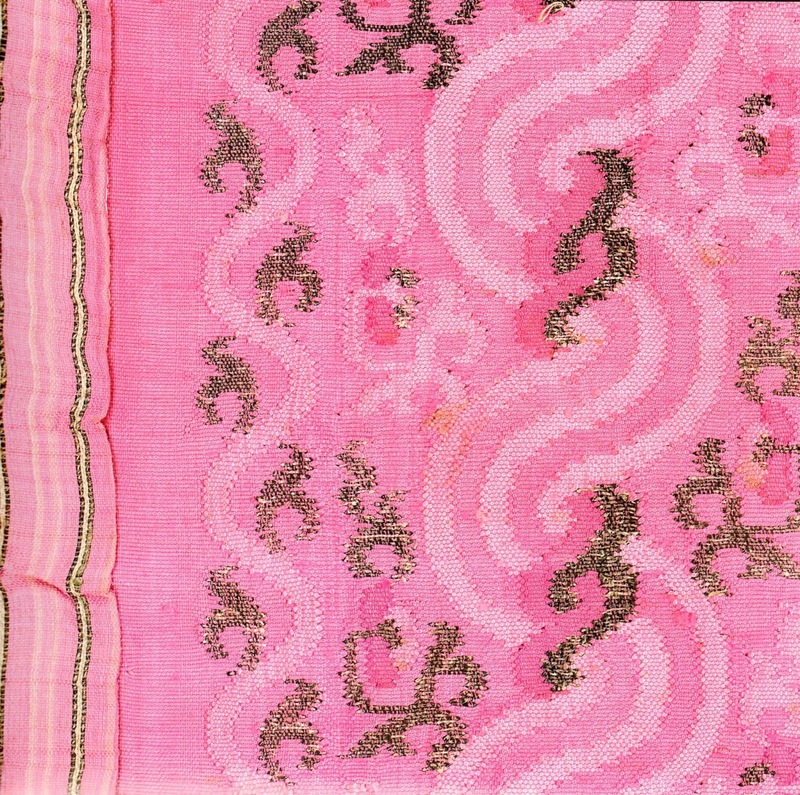 Luntaya acheik continued to be used, but so were other types of cloth. In the early 20th cent., women wore plaids, but soon abandoned them, leaving them to the men. 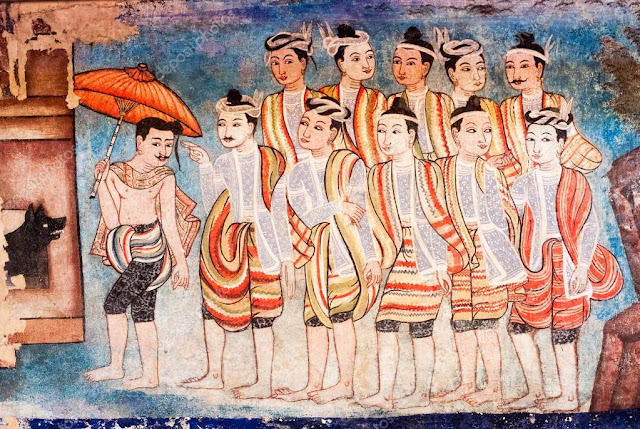 As we can see in the mural at the head of the article, young men of courting age wore a headband, which was tied in many ways, a brief loincloth of expensive material, and a number of tattoos. Black designs covered the body from the waist to the knees, and so the breechclout was wrapped in a manner to show these off. 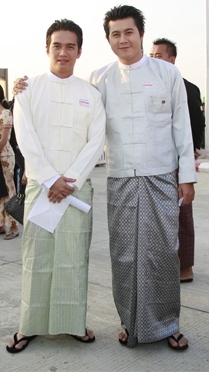 This was also done by the Thai and Tai Yuan. 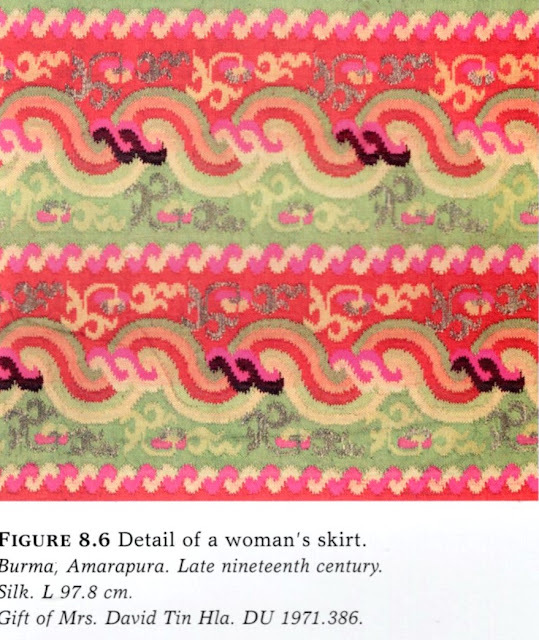 Distinct to the Bamar were the spot tattoos on the uppper body, done in red ink and featuring dancing monkeys and other animals in cartouches. These were meant to be protective in nature. The hair was long and gathered into a topknot, in contrast to the Thai, who shaved it except for an area just above the forehead, which stuck up like a brush in a crewcut. 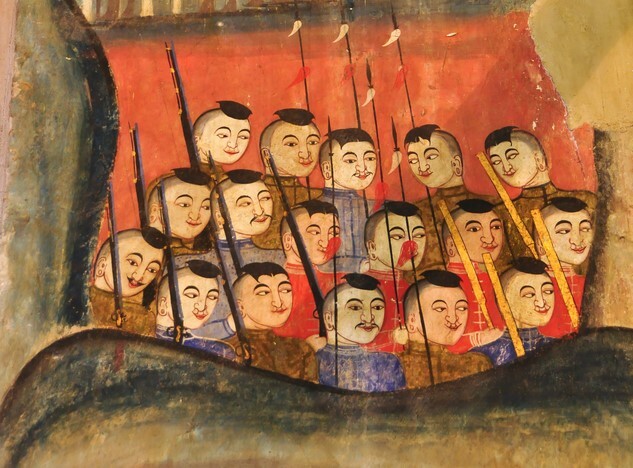 Here is a mural from the same temple showing Tai Yuan soldiers. Here is another mural showing visiting Bamar dignitaries in Northern Thailand. This is a mural in Wat Phra Singh in Chiang Mai. 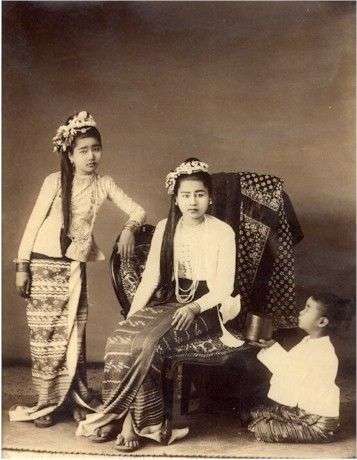 Notice the topknots, tied headbands, and thigh tattoos. 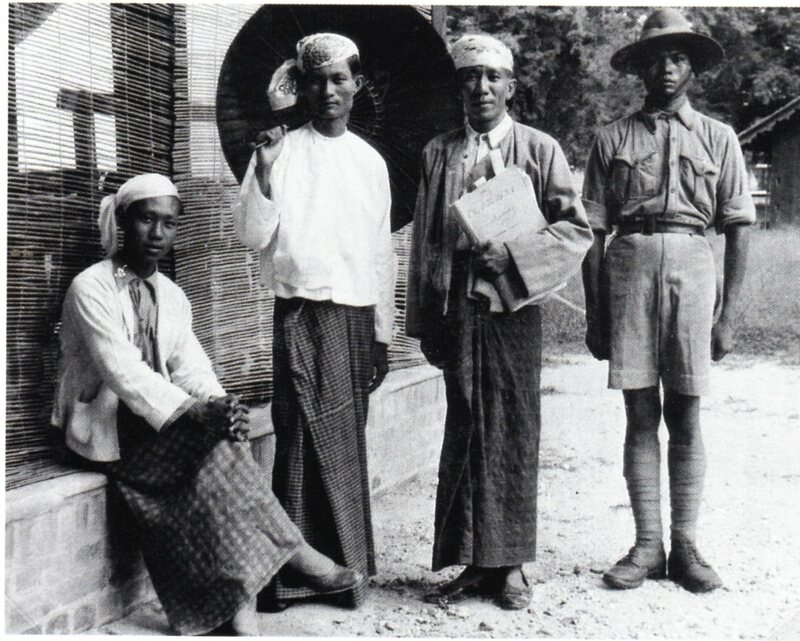 The men are also wearing eingyi jackets and a wrap called pahso, which may be up to 9 m long, wrapped around the hips, folded in front, and possibly passed between the legs and wrapped around the shoulders. A number of the pahso show the wavy lines of luntaya acheik. 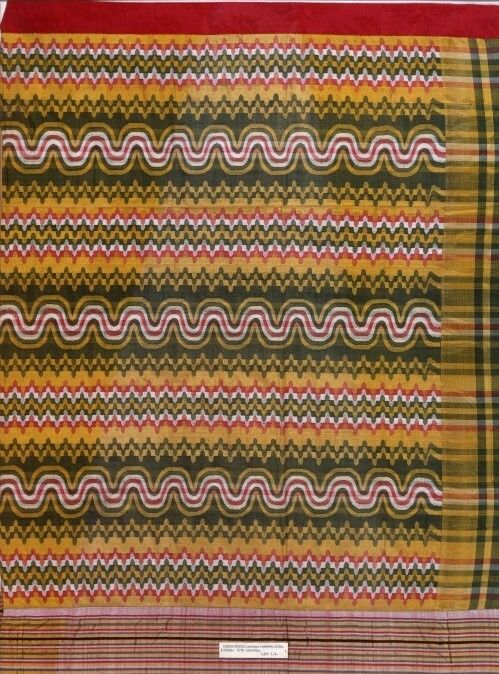 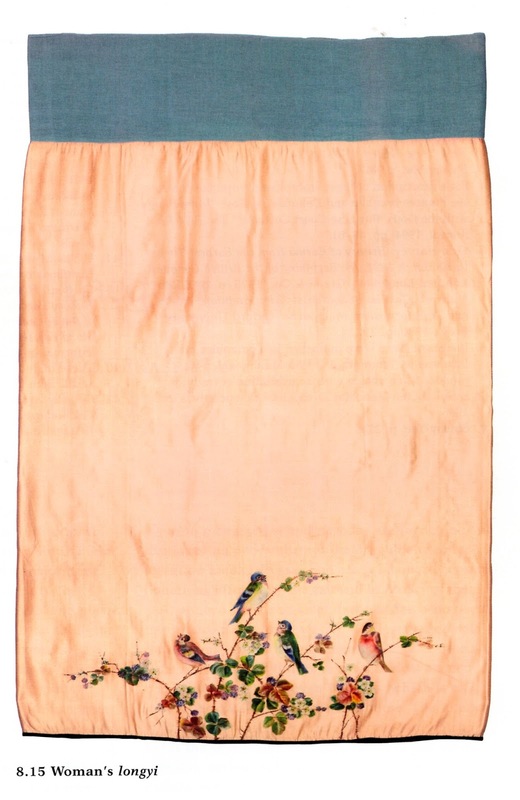 Here is an example from the Victoria and Albert Museum. 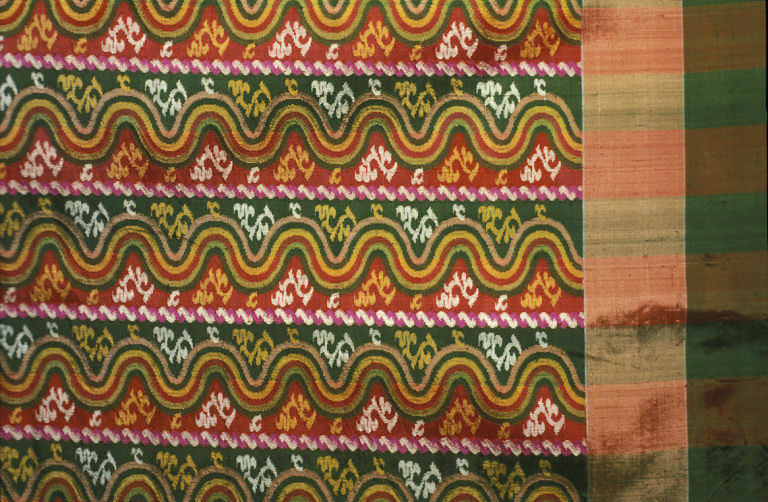 The pahso was always tied with folds in the front. Here are a couple of old photographs of this outfit. 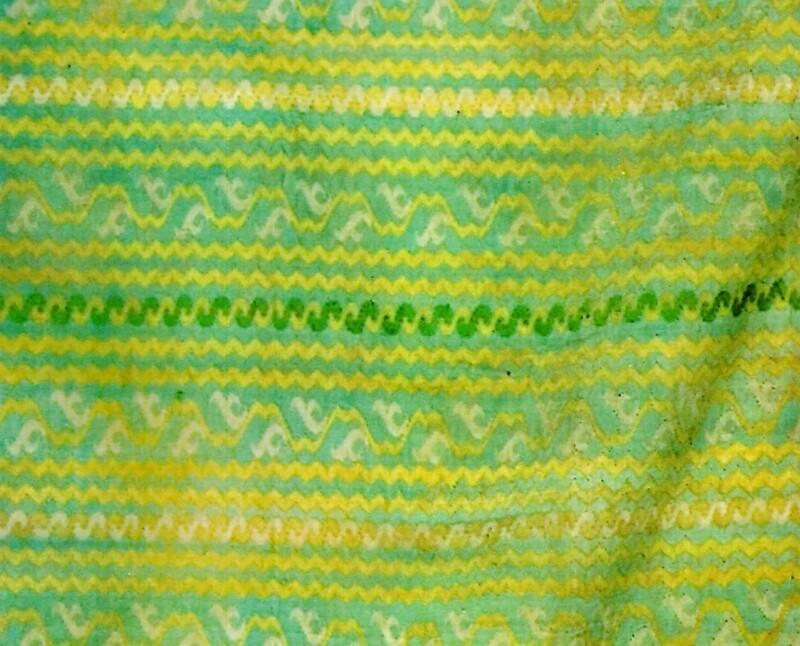 In this last example, another jacket has been layered on top. 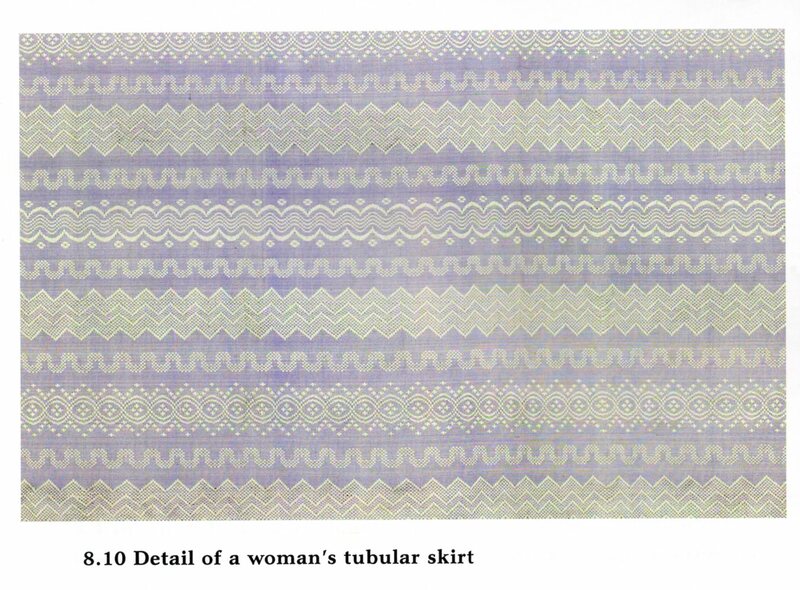 At the beginning of the 20th century, the men's outfit changed and simplified as the women's did. 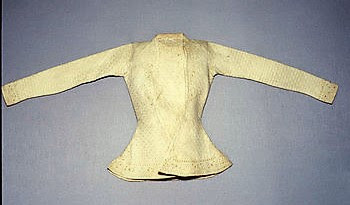 The pahso was made smaller, although it continued to be tied with a knot or folds in front. This was called longyi. 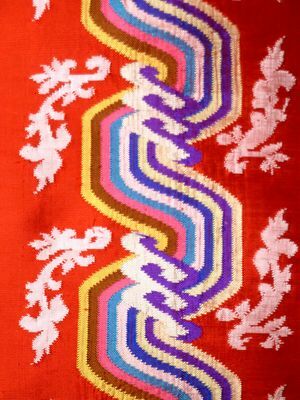 The bright colors were more rarely worn, the men adopting the sober and less flamboyant designs which were thought of as masculine by the British and other westerners. 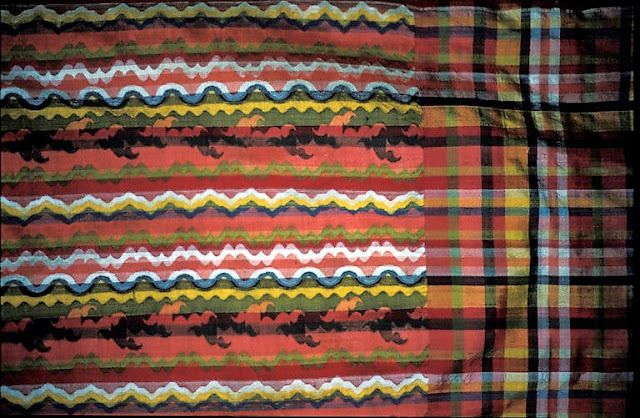 Plaids became the norm for men. 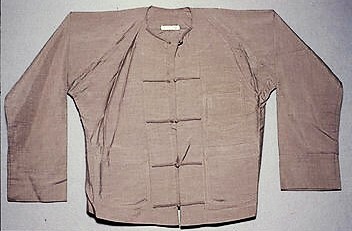 The jackets were shortened and came to more closely resemble those worn generally in the region, perhaps under Chinese influence. 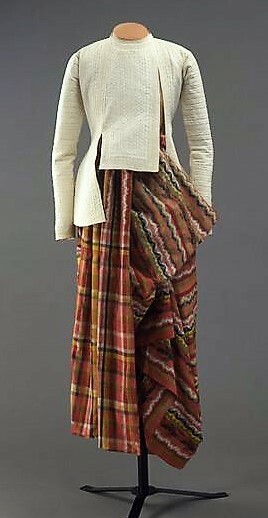 From the Victoria and Albert Museum, here is one jacket of the old style, followed by two of the new style. 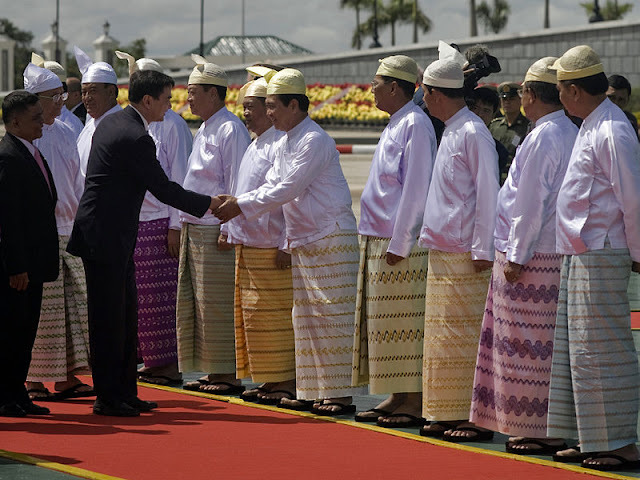 The individualized headcloth was replaced by ready made gaung baung, of light colored muslin, bought in the marketplace. 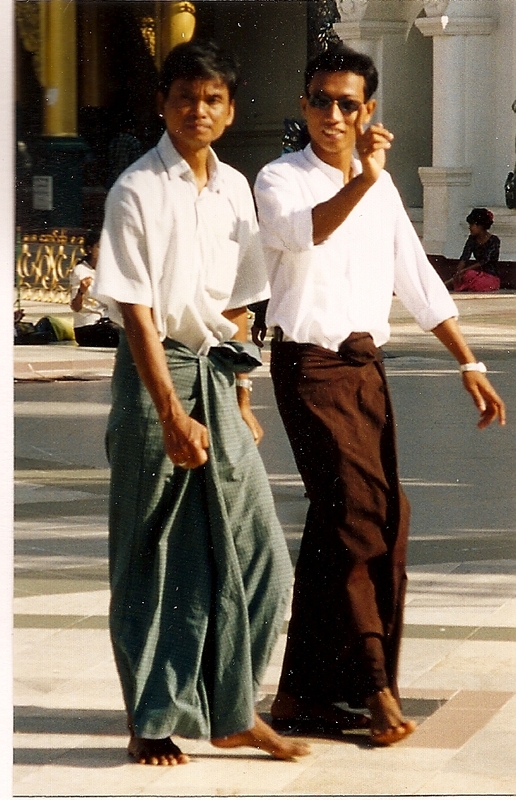 For work or sport, the ends of the longyi are twisted, passed through the legs, and tucked into the waist in back; this is called paso hkadaung kyaik. 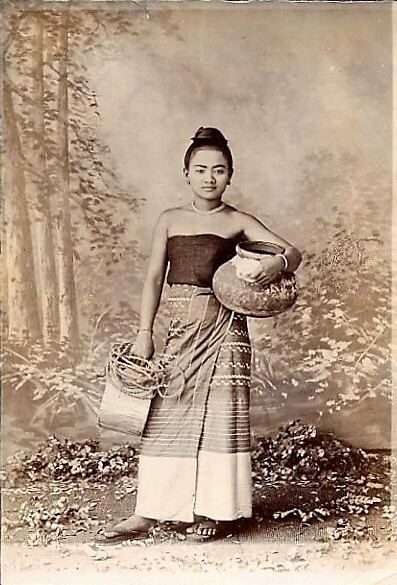 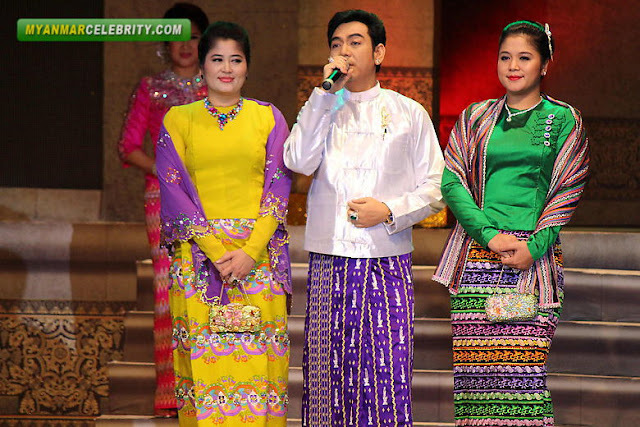 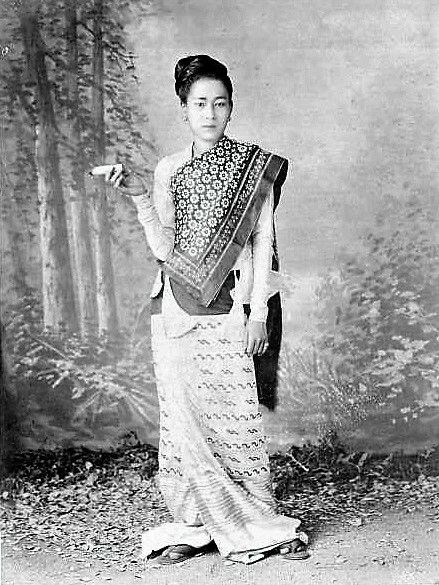 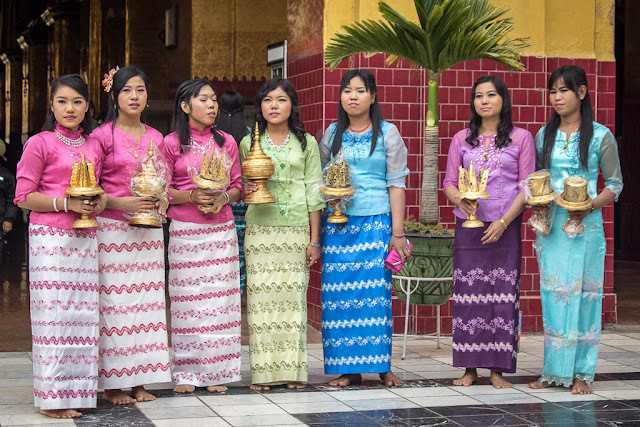 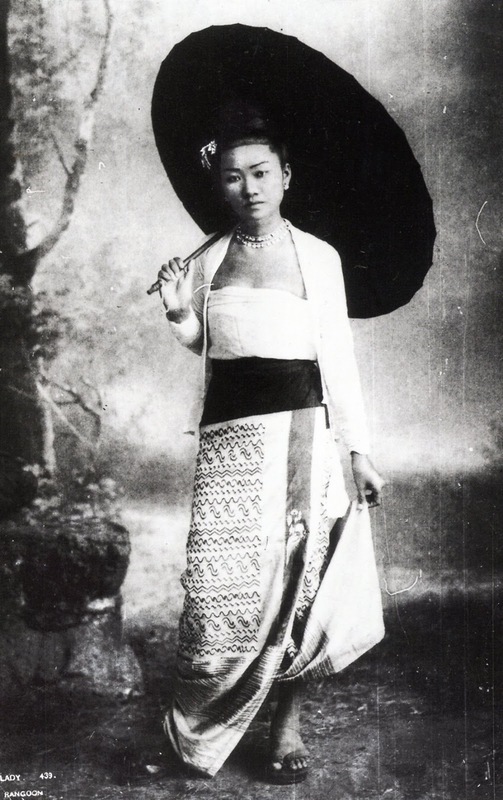 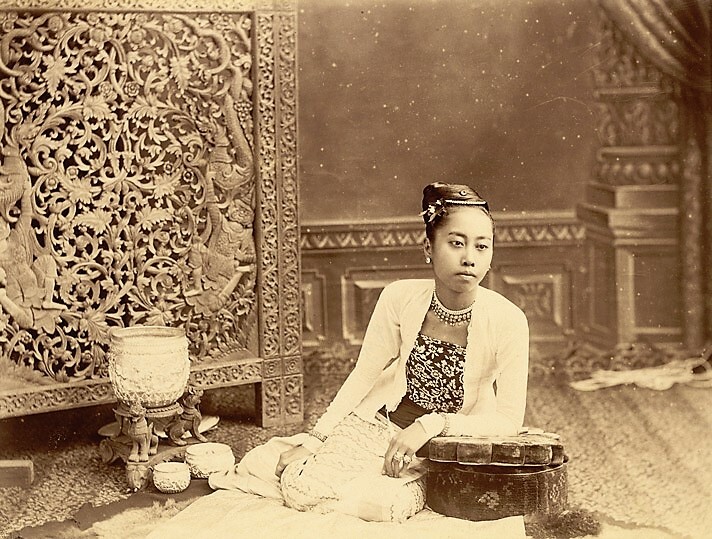 Unlike Thai, Lao, and Khmer women, Bamar women do not wear it this way. 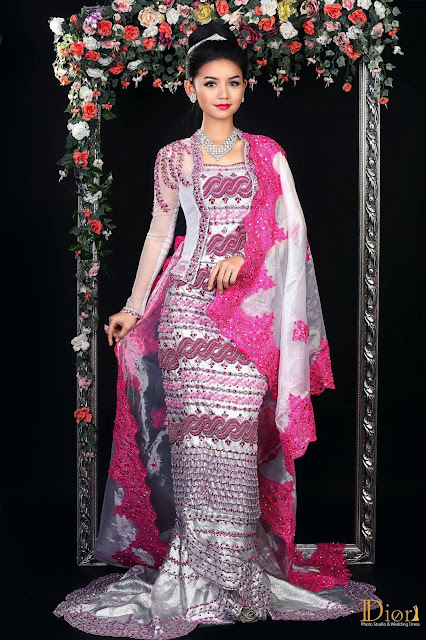 I will close with a number of images of this costume, some old, some new, some bridal outfits based on the old costume.